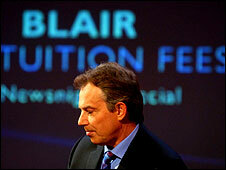 Of all the challenges facing the newly-elected Labour government in 1997, it would have been impossible to predict that it would be university fees that would bring Prime Minister Tony Blair closest to defeat. Tuition fees - the charges paid by students towards the cost of studying at university - became a persistent thorn in the side of the government. When it was proposed that the fee should be hiked to £3,000 per year, it created a bigger backbench rebellion than any other controversy, including the Iraq War. How did student funding become such an emotive subject? And who won the argument? When Labour entered office, they inherited a report on higher education funding which had been commissioned by the previous Conservative government. The explosive recommendation of the report was that the principle of university education being free at the point of delivery should be scrapped. Students would have to make a contribution, said Sir Ron Dearing's landmark report. 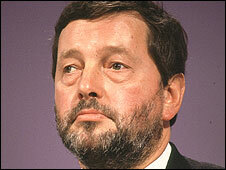 David Blunkett, the education secretary, announced that the fees would be introduced. The argument was that this was a fair way to fill a funding gap. Students would benefit from getting a degree, so they should at least pay something towards the cost - and the amount would be £1,000 per year. This was an issue that cut to the core of Labour values. Many Labour MPs had themselves benefited from an era when a relatively small student population paid no fees and received non-repayable grants. A former Labour education secretary, Ted Short, told the House of Lords the plan to introduce fees made him ashamed to be a member of the party. Students protested in large numbers, there were sit-ins and walk-outs. There was also a constitutional tangle over how the fees would be charged in the devolving administrations in Scotland, Wales and Northern Ireland. But an unflinching David Blunkett pushed through the fees plan, which entered the statute book in July 1998 - in time for the new academic year. The principle of charging students had been established. However there were still warnings about this being the thin end of the wedge - and that universities would want to "top up" the £1,000 with an extra charge. Protests from students continued to grow. There was a fees boycott and the Department for Education and Employment's Westminster headquarters were occupied by angry students. There were warnings that this would be "Labour's poll tax". When Labour approached the general election in 2001, its manifesto defended the existing fee as promoting "access and excellence". But it drew a line in the sand and promised: "We will not introduce 'top-up' fees and have legislated to prevent them." Once again, the backwaters of university funding were going to create a storm that threatened to sink the government. Education Secretary Charles Clarke, a former president of the National Union of Students, revealed plans for a dramatic shake-up of student fees. There would be "variable fees" which could rise to a level of £3,000 per year - balanced with a complex package of grants and subsidies for students from low-income families. These would no longer be paid "up front", but would be repaid once the student entered work and was earning £15,000. There were howls of protest from students, who now faced a £9,000 price tag on a degree - in addition to repayments for student loans for living costs. Labour backbenchers began to complain in large numbers - warning that such a debt would deter applications from poorer families. In response, the government argued that the higher fees, coupled with the means-tested grants, were essential in "widening participation". If universities were to be given the extra cash from higher fees, they would have to open their doors a little wider to youngsters from the poorer postcodes. But the rebels remained unconvinced - with the ideological split widened by rival factions within the Labour party. 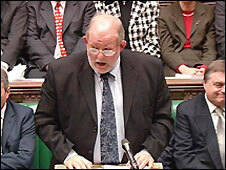 In January 2004, the vote was still on a knife-edge when MPs began to debate the plan to hike fees. 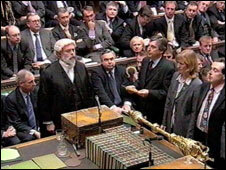 Tony Blair had put his reputation on the line, the fate of the government hung on a few backbench votes. The government scraped through by five votes. University leaders expressed their delight, students their outrage. But the higher fees were implemented, with almost all universities setting their fees at the maximum level. Students might not have welcomed the change, but they seemed to accept fees as part of the higher education landscape. Applications to university rose after the arrival of tuition fees - and did not decline as feared. The Conservatives, who had promised to scrap tuition fees, quietly dropped their opposition after the 2005 general election. University life has had to absorb this culture of fee charging. Students were becoming customers, they expected facilities, accommodation and services which reflected their investment. Students who knew they would graduate with tens of thousands of pounds of debt wanted to have value for money from their courses. Tales began to appear of students suing universities because there were not enough lectures, rather than staff chasing absent students. 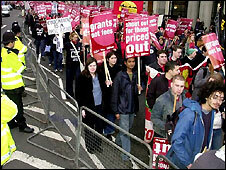 A decade after the first tuition fees were paid, the National Union of Students ended their campaign against tuition fees. This will not be the end of the story. Another phase of negotiations, about to begin this summer, could see an even higher level of fees. This could result in the creation of a "market" in courses and universities, if the upper limit is set high enough for a variety of prices. But after the battles over whether students should be paying anything, the argument appears to have shifted to how much is reasonable.